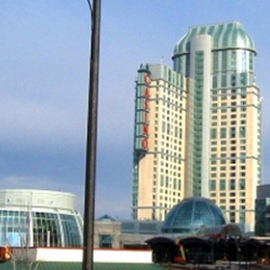 When the Niagara Fallsview Casino was completed in 2004, the project management team wanted to be sure all of the construction phases were completed properly. Boldstar completed the building envelope infrared scan as part of the construction due diligence study. We completed the scan of the entire Fallsview complex and identified locations of air leakage and other thermal anomalies. The identifed problems were corrected by the construction company. A typical example of what we found for the casino project management team. In the image above you can see a small area of interior heat air leakage. The arced window (rotunda) stress plate was not properly sealed at the interface. Boldstar Infrared Services Inc. delivered a detailed report of all the noted air leakage locations. The Boldstar infrared scan provided a great due diligence tool on this project.